One of the FBI’s most wanted hackers who was behind the largest theft of financial data has finally been arrested at the JFK airport in New York. 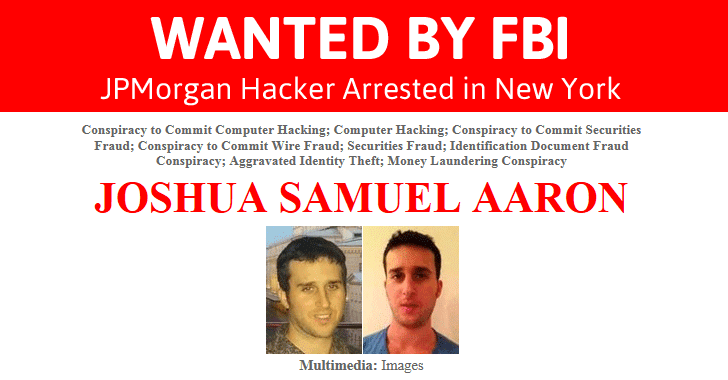 Joshua Samuel Aaron is accused of being part of a hacking group that attacked several major financial institutions, including JPMorgan Chase, and according to the officials, which was "the largest theft of user data from a U.S. financial institution in history." Aaron was believed to have been living as a fugitive in Moscow, Russia after being charged with hacking crimes in 2015, which exposed the personal information of more than 100 Million people. On June 2015, a federal arrest warrant was issued for Aaron by the United States District Court, and the FBI and US secret service agents arrested him upon his arrival at the JFK airport in NY, announced the US Department of Justice. "Aaron allegedly worked to hack into the networks of dozens of American companies, ultimately leading to the largest theft of personal information from US financial institutions ever," said Manhattan US Attorney Preet Bharara. "For pursuing what we have called ‘hacking as a business model,’ and thanks to the efforts of the FBI and the US Secret Service, Aaron will now join his co-defendants to face justice in a Manhattan federal courtroom." In 2015, the US Court of the Southern District of New York charged three men — Gery Shalon, Ziv Orenstein, and Joshua Samuel Aaron — with 23 counts, including hacking, identity theft, securities fraud, and money laundering, among others. All the three hackers were accused of running an illegal payment processing business that the men used to stole $18 Million (£14.3 Million) from victims. The three of them also hacked into a credit card company investigating their payment processing business in an effort to avoid detection. Shalon and Orenstein were arrested in Israel in July 2015 and already extradited to the United States in June 2016. Aaron is scheduled to appear in a Manhattan court on Thursday, according to the US authorities.